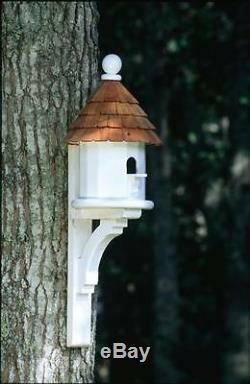 Lazy Hill Farm Designs Small Shingled Bird House 41429 Bird House NEW. Product Features The base of all of our bird houses and feeders are made of a solid cellular vinyl, a wood alternative that gives you the look and feel of wood, with little maintenance. The end result is an architecturally pleasing house that looks like wood, but lasts like vinyl. We also offer posts made of vinyl and our natural cedar posts for those that prefer the unstained, rustic look. An adaptation of our popular Lazy Hill House, this version makes a good home for any small bird. The body is made of solid cellular vinyl, a wood alternative, with the look and feel of wood, with little maintenance. The roof is made of redwood shingles Roof removes for easy cleaning. Made in the USA Assembly Required : No Country of Origin : U. Material : Vinyl/Redwood Finish : White/Natural UPC - 704940414292. Note: The bracket is not included with that bird feeder. Check out my other items. Be sure to add me to your favourites list. The item "Lazy Hill Farm Designs Small Shingled Bird House 41429 Bird House NEW" is in sale since Wednesday, November 19, 2014. This item is in the category "Home & Garden\Yard, Garden & Outdoor Living\Bird & Wildlife Accessories\Birdhouses". The seller is "sarafankit2009" and is located in Olean, New York. This item can be shipped to United States. Size: 9.25" x 9.25" x 14"